Us girls don’t need much of a reason to buy a new dress, but with prices like the ones featured in the George Clearance Sale, we reckon it’ll be more than just the one you’ll be going for. The PU shoulders of this Printed Dress makes this items one we want for our wardrobe. Its also down from £16 to just £9.50. 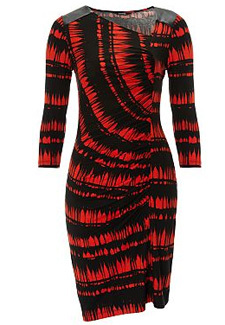 This Moda Print Dress is one of our favourites too. The fabric and cut of this dress will flatter curvier shapes, and the pattern is a subtle nod towards the geometric trend. Now only £9.50! How about an on-trend Colour Block Dress? The turquoise skirt and zip pocked details helps this outfit appear much more pricier than its ‘under £10’ price tag! For more sale items, check out the George website – happy shopping!